Animefringe: Reviews - Fruits Basket Vol.2: What Becomes of Snow? Fruits Basket Vol.2: What Becomes of Snow? Format: bilingual DVD, 6 eps., 123 min. Comments: A strong second volume in what is turning out to be a very deep series. As discussed ad nauseum in our previous feature of this title, Fruits Basket is very much a series about growing up and wanting to be a part of something larger than oneself. Fruba really does a good job of addressing the social strata present in the lives of young people, and this becomes even more apparent in this second volume of the series as we learn more about Tohru's relationships with her friends Uo and Hana and see more of her new life with the Sohma family. Volume two of Fruits Basket starts off strong, with some heavy bonding between the principle characters and two new members of the Juunishi (zodiac animals) introduced right off the bat in episode seven. Hatori, the doctor of the Sohma family, comes to check on Yuki at school by the request of Akito. He brings the bubbly Momiji with him, and before you know it, Momiji has transformed into his zodiac form. This episode ends on a slightly darker note with Hatori's invitation to Tohru to come to the main Sohma house... alone. In episode eight, we learn even more about the nature of the curse that plagues the Sohma family. And in all of this, the burning question is... When the snow melts, what does it become? Episodes nine focuses on building relationships and even subtly hints at budding romantic tension between the main characters during the events surrounding the New Years festivities. Episode ten is a turn back to the lighthearted when we meet another member of the Sohma family, Hatsuharu. Look forward to more fight scenes and madcap animal-transformation-mayhem in this one. As we get to know the characters better and the story progresses, we slowly start to see Yuki's walls start to come down... which could be very interesting come episodes eleven and twelve, covering Valentine's day and White day respectively. Volume two of this series, "What Becomes of Snow?" takes us deeper into the relationships forming between this unlikely mishmash of characters, and as each of them get to know one another better, they all find something to admire in each other. I've said it before and I'll say it again, anyone who went through the true process of growing up in earnest will find something to relate to in one of these characters. The struggle to fit in, the process of learning about oneself through your relationships with others, the travails of life are all very real in this series, even if the situations in which they are presented is somewhat less than realistic. Fruits Basket is a high quality series with subdued music that fits the scenes, smooth and fluid animation, nicely detailed backgrounds, and sound effects that mesh perfectly with the situations. The Japanese voice cast is top-notch, with every voice fitting perfectly with its respective character. The subtitling is mostly true to the original script, with a few changes here and there. Once again, I am very impressed with FUNimation's treatment of this dub, with one exception: the voice of Momiji. Even though he is not much younger than Tohru and the others, Momiji is portrayed as an excitable young boy in the series, but the English dub voice sounds somewhat rigid and is more like that of an older girl. I really found it somewhat jarring to hear such an obviously female voice coming from Momiji's mouth, and it detracted from many of the scenes that he was in on this disc. It seemed to be a very unnatural voice for this character, and it did cause a little loss of that sense of realism in my case, making it difficult to immerse myself in the story. However, I do offer kudos on the choice of voices for both Hatori and Hatsuharu. Both of those voices seemed to really fit the personalities of the characters well, allowing them to fall right into step with the other characters previously introduced. The release itself is pleasing in the extras department. The cover is once again very understated and has in insert housing brief synopses of the six episodes on this disk. The scene selections are nicely placed, the textless opening is included, and the character profiles are done well. The "Fruits Basket Room" special extra is a nice inclusion, featuring some of the Japanese voice actors in the series discussing their roles and the series itself. There's also a nice little featurette on the eyecatches and "ka-ching wipes," hosted by Yui Horie, voice of Tohru Honda. Rounding out this very nice set of extras is an interview with Akitaroh Daichi, the director of this series. I have to give FUNimation another round of applause here, because I consider this a very nice set of extras, a strong follow-up on something that started out well in the first disc. Aside from a few flaws in the subbing and dubbing, I am extremely happy with FUNimation's treatment of one of the finer shoujo series to come out of Japan in the last few years. If the current trend continues, then this will be a quality collection of DVDs that no shoujo fan should be without. If you love shoujo and you haven't seen this series, check it out right away. 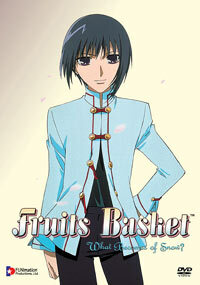 Even my male friends and my Dad like the series quite a bit so far, so even you skeptics out there... give Fruits Basket a chance to win your heart!